The solar panels are synthesized using single crystal silicon, and the light conversion rate is as high as 23%. Usually, in the case of sunlight, the solar energy is fully charged in just 8 hours. The irradiation time is 12 hours or more. You don't have to worry about the nighttime lighting time is not enough. The solar light remains off when there is no motion transition within 4 meters of the attachment. 20 seconds when no action is detected. The light will automatically turn off and charge the battery again at sunrise. Use a power drill (not included) to create 3 holes on the mounting surface of your choice. Gently tap the three included wall plugs into the holes and secure the mounting brackets into the holes using the 3 screws provided. Note: It is recommended to install at 2.0-2.5 meters (6.5-8.2 feet) high. Install the spotlight on the mounting bracket. Adjust the lighting angle as needed. 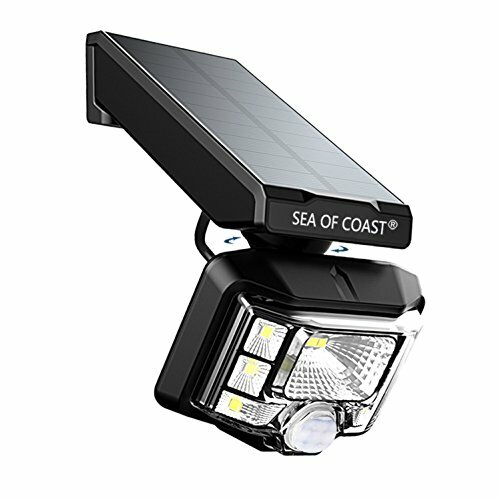 HARNESS THE POWER OF THE SUN: Innovative technology allows you to use solar energy to power this bright sensor light. It's a great way to illuminate areas of your home while saving electricity! The lamp holder is designed with universal rotating structure, which can be adjustable 360 degrees that meet your different lighting angle. The motion sensor lies in the bottom of the lamp holder. While the sensor detects motion at night, the spotlight will be switched from the dim light to the high light. The on-off switch is on the back of the lamp holder. With single mounting bracket, the spotlight is easy to install and disassemble. It is ideal for front door, an entranceway, driveway, stoop, or anywhere around your home that has dark areas that need illumination. LIGHT MODES FOR EFFECTIVE ILLUMINATION: solar sensor LED light uses two different light modes to give you the brightness you need for different times of day. Automatically turns to bright when it detects movement. If you have any questions about this product by SEA OF COAST, contact us by completing and submitting the form below. If you are looking for a specif part number, please include it with your message.